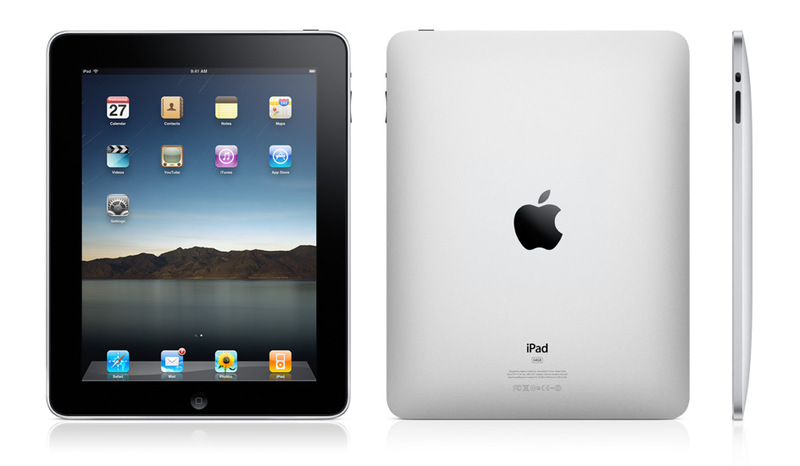 The long rumored Apple tablet device was unveiled today by Steve Jobs. On the tech side, the iPad has a 9.7-inch display that is 1024-by-768-pixel resolution at 132 pixels per inch, a full capacitive multitouch screen, 802.11n Wi-Fi, Bluetooth 2.1+, an accelerometer, compass, speaker, mic, and the the standard 30-pin connector. It also has a 3G option which I will get to in a few minutes. According to apple the iPad has a battery life of 10 hours because of the new Apple A4 processor. So what does the iPad do? Well, it is very much like a large iPhone. The iPad actually looks like a large iPhone as is meant to be slotted into your digital life somewhere between the smart phone and a laptop. The iPad can browse the Internet using Safari, check your email, let you look at photos, TV shows and movies, watch YouTube, play music, and read eBooks. On the plus side, the iPad uses the same Operating systems as the iPhone so all the apps for the iPhone work on the iPad. New apps will take advantage of the bigger screen and faster processor but it does mean that there are a great many iPhone / iPod users who have a ton of content for the iPad already and developers can easily make the same content available for multiple devices. Another plus is the new Apple IBook store where you will be able to purchase electronic books directly on the iPad. As this is a site for photographers and those interested in photography, lets look at the iPad from a photographers point of view. The first thing I noticed during the Apple presentation is that the device does not seem to handle Adobe Flash which is not surprising since the iPhone doesn’t handle Adobe Flash either. Many photographers still use Flash for their websites and portfolios and if, as a photographer, you want to make sure that the widest possible audience actually sees your website, Flash will either have to be supported or the websites and portfolios will have to be changed. The second thing that I think is interesting is that Apple has a iPad Camera Connection Kit. This kit gives you two ways to import photos and videos to the iPad, either using the camera’s USB cable, or the SD Card Reader. This means that there is now a way to shoot, show and store images in the field that does not require a laptop. On the downside, there is not enough internal memory to store very many RAW files or full video clips and just like the iPhone / iPod Tough there doesn’t seem to be a way to increase the memory externally. There is no data plan or contract with the iPad but instead Apple has a deal in place with AT&T for two different data plans. The first would be a $29.99 unlimited data and the second a $14.99 for 250 MB of Data. If you have the iPad that has 3G capability, you can order the data plan directly from the device and basically pay as you need it. For our international readers, this only applies the the United States all international pricing will be announced at a later date. Hopefully it will run OnOne’s DSLR Camera Remote (http://bit.ly/93JUdI). With the IPS screen it would make an incredible remote control. In a studio environment you could set up your camera, then walk around with the ipad, interact with your models, all while getting high quality previews on your mobile, wireless device. If you are shooting in a static location in the field, you could utilize it as well. As a Canon shooter, I’m disappointed by the SD option only on the Camera Connector kit. I hope that it lets you at least hook up card-readers instead of cameras and I really hope it is capable of showing RAW files. As a Nikon shooter who uses CompactFlash cards the SD option is useless to me but what the kit looks like it does is create a way to plug in a cameras USB cord into the iPad. I would assume that this means that any USB card reader would work. Right now I have no way of knowing if this is true or not but it will be one of the first things I test when I am able.